In the last three years, I feel like I've represented all of my favorite Vegan convenience foods. From Uncle Eddie's Peanut Butter Chocolate Chip Cookies, to Upton's Seitan Tamales to So Delicious Almond Milk Ice Cream Minis, I feel like I've been covering my bases. Well, shockingly, there was one glaring omission. Amy's Organic Beans & Rice Burrito! For real, I eat that thing all the freakin' time. How have I not blogged it yet? Maybe I take it for granted? I have no idea, but I'm glad to finally show my love for one of the best Vegan convenience foods EVER. So, there are many way to eat an Amy's Beans & Rice Burrito. 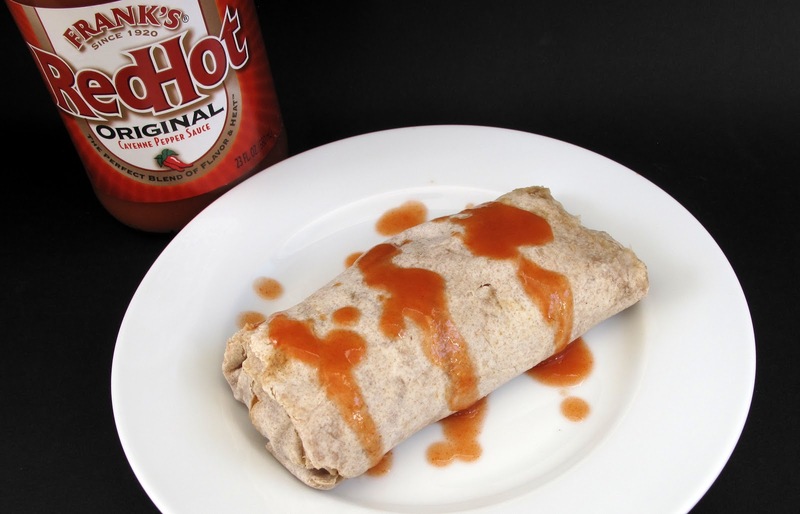 My favorite way right now is to simply douse the burrito with Frank's Red Hot. I also love it with Food For Lover's Queso on top with lettuce and tomato. To those who have never had the pleasure of eating a Beans & Rice Burrito, it's got lots of flavorful refried pinto beans and yummy brown rice. Not spicy at all, which is great because you can dress it up how ever you want. On the nutritional tip, you are looking at 10 grams of protein and 6 grams of fiber. A pretty nice meal when you're in a jam. And don't forget to save those burrito wrappers for Amy's Points! Thank you to Amy's for creating one of my all time favorites. I just discovered those last week. They were on sale so I bought a bunch of them for my son. He loved them. I'm definitely going to pack my basket with them next time I'm food shopping. They are so convenient. Love those burritos. And everything is better smothered in Frank's. you know i was JUST talking to my friend about these today! that photo with the hot sauce makes me want one right now! I'm eating an Amy's burrito right now! With Frank's Red Hot! Delicious and Healthy. Taste better than other leading products. Big and Full of Beans, Rice and Flavor. The Best!